Strawberry lemonade becomes one of my favourite drinks. I used to buy the store bought strawberry juice which is so pulpy and it wont taste mild. After having that fresh juice i feel heavy like had some food. Unlike that this one is thin and a perfect thirst quencher. On summer days if you have the strawberry syrup this could be prepared in a minute. 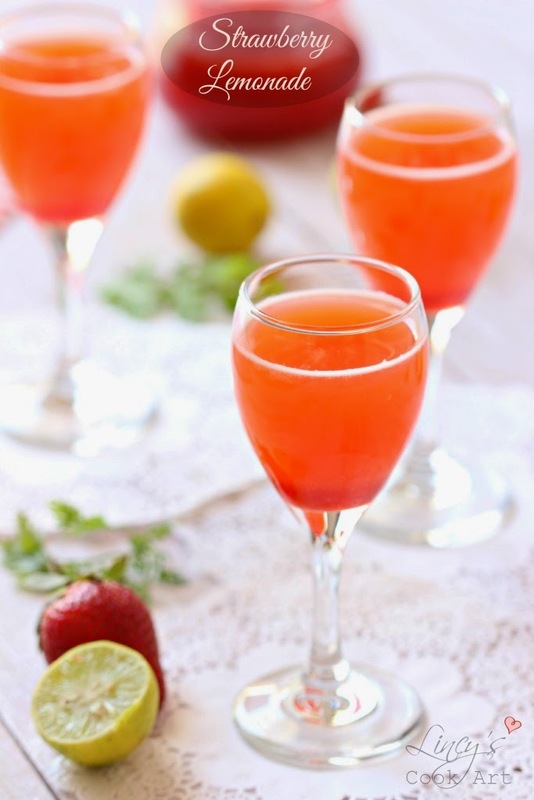 This strawberry flavoured lemonade is so colourful and tasty which kids love to taste it. Healthy home made lemonade with home made ingredients with out any preservatives. I planned make tomorrow too the same lemonade. Do try and Enjoy!!! Chill the water inside the refrigerator. Set ice cubes if desired before hand. In a glass squeeze the lemon and add the juice without any seeds. On top of that add the chilled water. Add a pinch of salt to lift the sweetness if required. Add some ice cubes if desired and serve chilled. refreshing drink and recipe...looks awesome!!! love the color and just love your pics... too good!